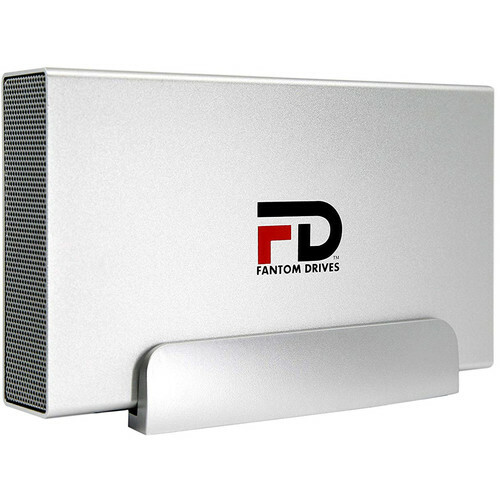 The brushed silver Fantom 4TB G-Force3 USB 3.0/eSATA Aluminum External Hard Drive features a fan-free design for virtually silent operation and can be stored horizontally or vertically to optimize your workspace. The Fantom G-Force3 offers reliable storage expansion from your limited built-in hard drive so you can store all of your valuable data and digital memories. The Fantom G-Force3 hard drive is suitable for audio and video professionals and consumers alike. The G-Force3 offers plug-n-play simplicity in a rugged unit that provides optimal storage for all your photos, music, videos and documents while traveling to another location. The USB 3.0 interface is backwards compatible with USB 2.0 and supports transfer rates up to 10 times faster than USB 2.0. The eSATA host connectivity allows fast transfer connection to eSATA equipped computers.